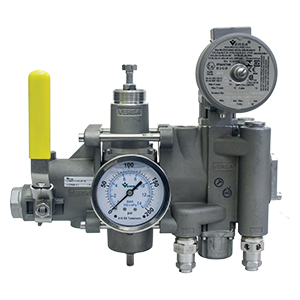 Major components include shutoff valves, filter/regulators, speed controls, and directional control valves. 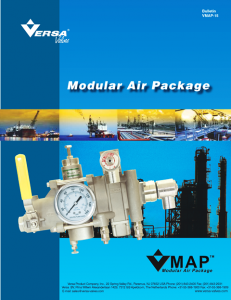 The Versa VMAP (V316 Modular Air Package) is a compact air management system, providing a full range of pneumatic accessories and functions to meet the needs of most control systems in the actuator control industry. 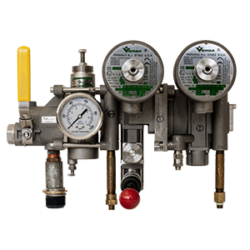 Major components include shutoff valves, filter/regulators, speed controls, and directional control valves. Versa’s VMAP simplifies the design process by combining all the components of a common circuit into one integrated assembly. Whether a standard shutoff circuit or an intricate control system, VMAP’s features meet the requirements of any control project. VMAP will reduce costs, components, engineering, vendors, weight, and time with only one component to mount. 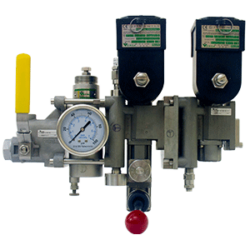 Modular actuator control system with integral Filter, Regulator, and Valve modules. Optional speed controls and check valves also available.